This tour was an excellent way to see the city of Copenhagen. It was a small group and our guide was very knowledgeable.We came into town on a cruise and our boat got in a bit late. Then we were delayed by traffic. We called the shop to let them know we were on our way and they kindly waited for us to get there. That was greatly appreciated!There are plenty of places you can rent bikes on your own, however, the tour allows you to ride through the city and take in the sights without worrying about navigating. Your guide leads you to many different locations and photo opportunities. Along the way you learn about the history of the city and its inhabitants. I would definitely recommend the guided tour for the above reasons and for the fact that the city is fast paced and I could see how it can be overwhelming to find your own way on the bikes. In addition, there are many areas where you must get off and walk your bike. If we would not have been with a guide, we may have made the mistake of riding in no ride zones. And no one wants to be THAT tourist! The bike tour around Copenhagen was amazing. Our tour guide, Sylvia, was very knowledgeable and informative. 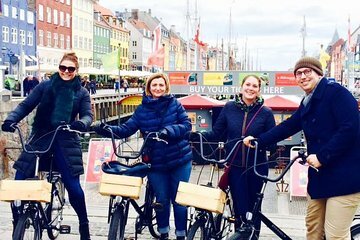 This was a great way to get to know the great city of Copenhagen. I strongly recommend it. This trip was a great way to get oriented to the city in a short amount of time. We biked 8 or 9 miles over the course of 3 hours, so a very relaxed pace with lots of great local knowledge along the way. Awesome tour we had great weather in May, high 70's and sunny, so got lucky. I love the bike life. We were able to see most of the main attractions and get a good idea of what the city has to offer (which is a lot!) our guide was very informative and the tour size was manageable. Alll in all, a great tour! Seeing the city by bike was fantastic! Sophia had good local knowledge of the city and its history. Excellent tour, excellent guide, a great way to see the city. We had 4 people in our bike group. Jessica was our tour guide, extraordinaire. She paced the ride to our ability and structured the tour as to what our interests where. Our 3 hour trip covered a lot of ground but with well spaced breaks for pointing out attractions with knowledgeable commentary and time for pictures. She also pointed out a best value canal tour, authentic Danish food restaurants, and the best breweries. She kept a close eye on us to safely take us point to point. Thank you for a fun morning. I highly recommend this tour.